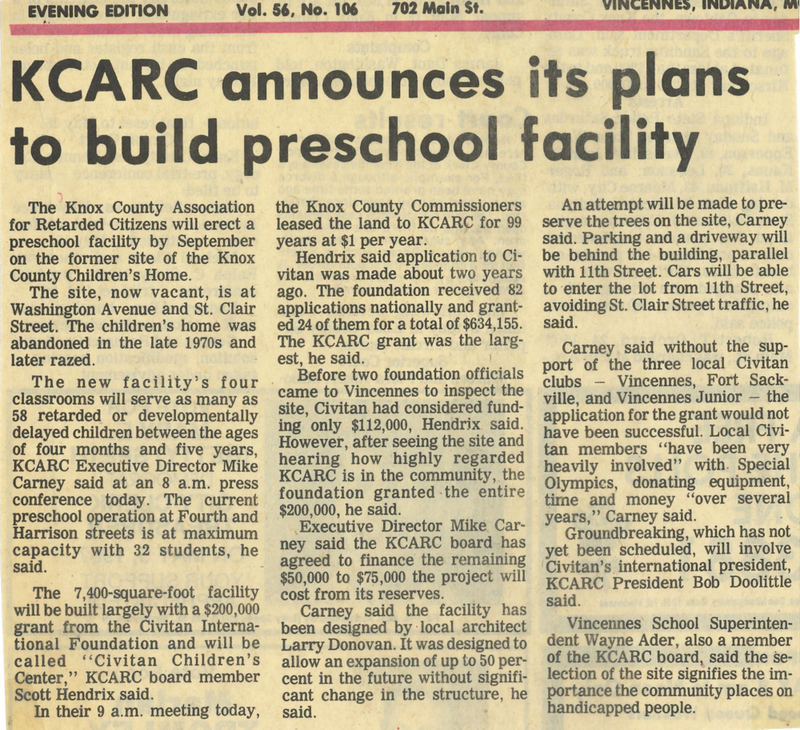 The dream of a few individuals in 1969, to the humble beginnings in 1972, to what KCARC is today – an economic asset, a major employer, and a haven for many people. 1972 – Opening of preschool programs for youngsters with mental retardation and the beginning of sheltered work opportunities. 1974 – First men’s group home opened. 1975 – Building of 4,800 sq. ft workshop (Plant I). 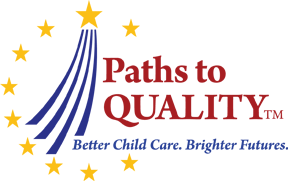 1976 – First women’s group home opened. 1978 – Expansion of work-center by 16,000 sq. ft. (Plant I). 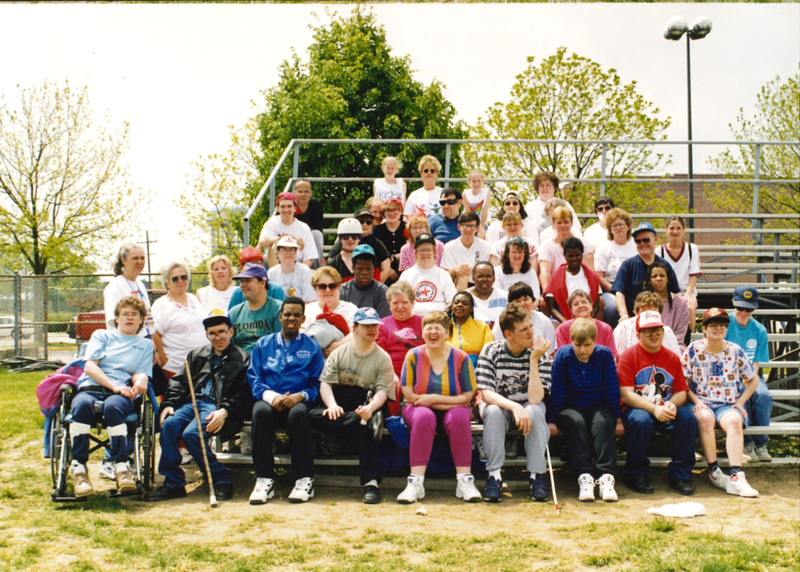 1982 – First co-ed group home opened. 1984 – Expansion of work-center by 30,000 sq. ft. (Plant I). 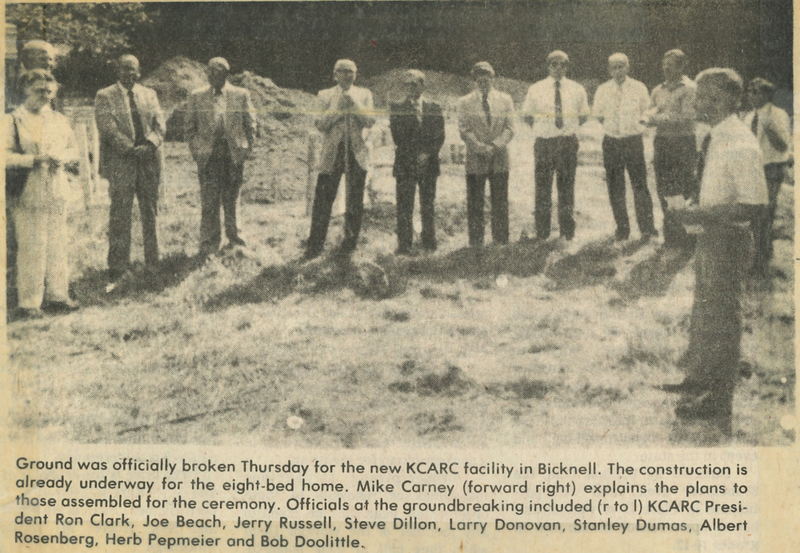 1986 – Construction of Basic Development Unit in Bicknell, Indiana. 1987 – Opening of newly constructed Civitan Children’s Center. 1988 - Construction of Intermediate Care Facility/Mentally Retarded (ICF/MR), consisting of 5 separate homes. 1990 – Construction of the geriatric group home in Bicknell, Indiana. 1991 – Construction of Plant III/Bicknell Business Center. 1993 – Construction of Plant IV. 1997 – Construction of Charles and Mary Baker Center. 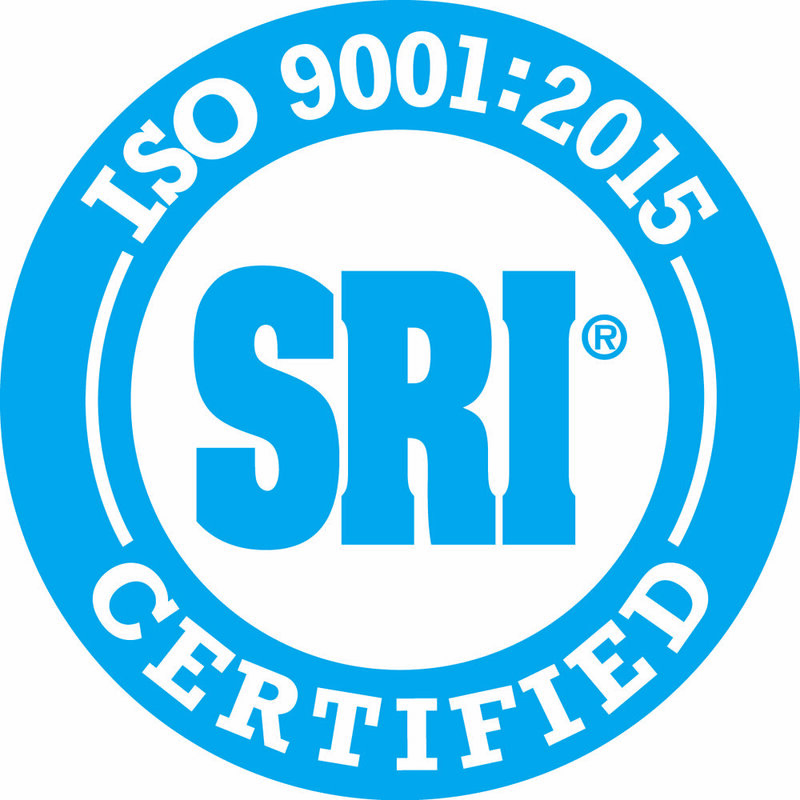 1999 – Became first company on North American Continent to be ISO registered for all program services, human resources, and finance offices. 2000 - Reconstruction of Civitan Children’s Center. 2001 – Construction of Tommy Wolfe Center (Mildly Ill Child Care). 2002 – Plant V – USDA Milk repackaging began; ICF/MR homes became CRF/DD; Restructured Residential into CRF and Waivers. 2003 – Dry good packaging began in Plant V.
2005 – Renovated office space at Plant V to relocate all administrative offices. 2006 – NISH funded pilot project at KCARC for Rose-Hulman Institute for Technology students to design assisted technology to enhance productivity for individuals with the most severe disabilities. 2007 - Began Discover the Possibilities media campaign. 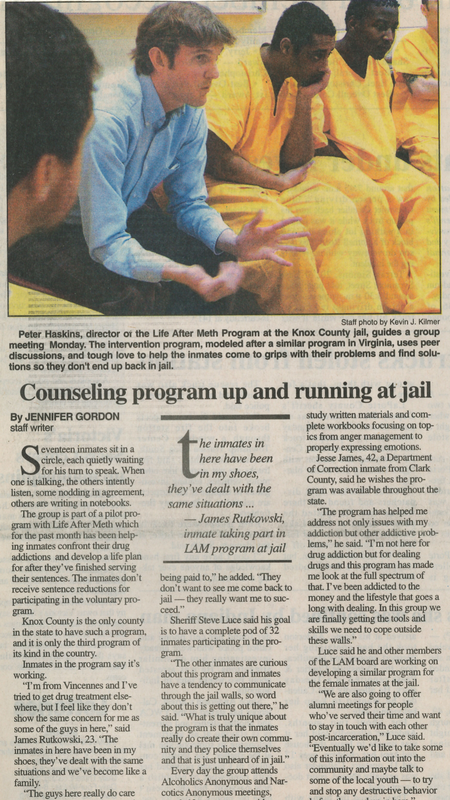 2008 – Began KCARC for Life program, which is designed to provide advocacy, connection, education, and support for the lifetime of individuals and families with special needs. 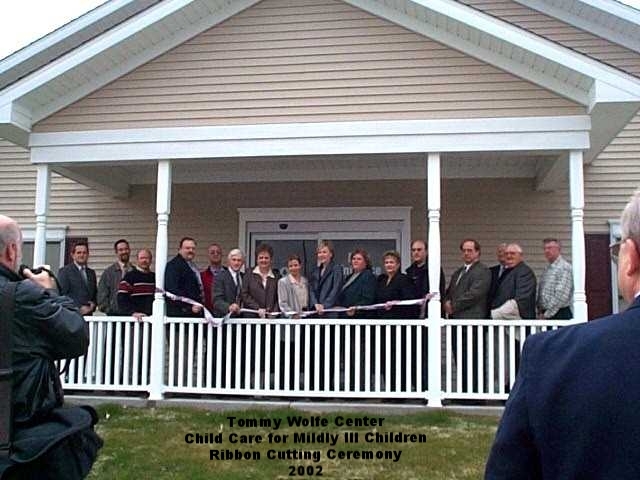 2010 – Tommy Wolfe Center converted from mildly ill childcare to Infant and Toddler Center, serving 16 infants and 20 toddlers. 2012 – Began producing canned non-fat, fortified dry milk for the United States Department of Defense. 2014 – Tommy Wolfe Center was converted into the Tommy Wolfe Wellness Center. 2015 – ECWCS clothing began being produces at the Bowling Manufacturing Plant in Loogootee, Indiana, for the United States Department of Defense. 2017 – Opened 1972 Community Center. 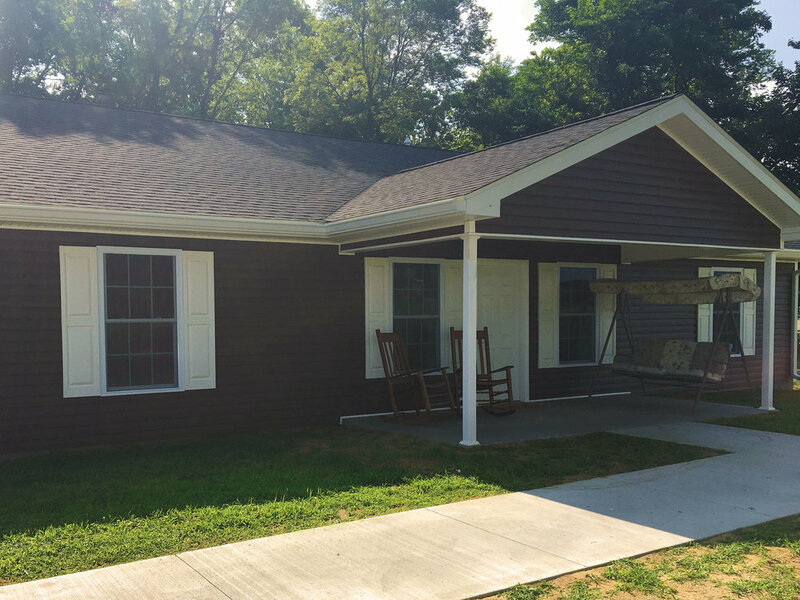 2018 –Construction of 3 new ADA accessible homes completed.